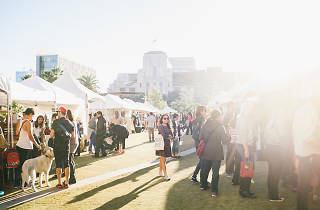 Many of L.A.'s most talented makers will be setting up shop at Renegade Craft Fair in L.A. State Historic Park on July 8 and 9, and Time Out is giving you the opportunity to take home a fat stack of goods from the best of the best. 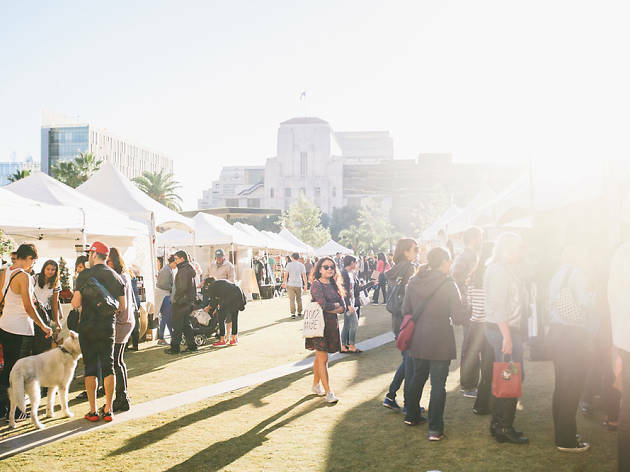 Enter below for your chance to win goodies from 16 of the event's top vendors (a value totaling $2,137). You can also drop by the Time Out Los Angeles booth (#17!) to take a look at all the goods up for grabs and to enter the giveaway in person. The lucky winner will be announced Friday, July 14! The Belle & Beast Organics provides handcrafted all-natural, organic beauty products for both women and men who don't take themselves too seriously. Treat yourself with this kit that includes Lip Polish, Coffee Face + Bum Scrub, a French Lavender Nighttime Face Polish, DIY mask trio to include: a Detox Mask, Rose Calming Mask, and a Brightening Mask, as well as an Under Eye Serum and Antioxidant Face Oil. Freundeskreis Goods is a collection of ceramics and accessories, designed and handmade by artist Sarah Ritz. Freundeskreis celebrates the marriage of simple form and color, honoring a spectrum of inspiration from simple desert landscapes to the set of Pee-Wee's Playhouse. The High Water shirt is California Cowboy's flagship product. Designed with apres-surf and pool parties in mind, this Hunter S. Thompson-and-James Bond inspired reinvention of the 1950s-era cabana suit is hand sewn in California. The High Water’s proprietary and innovative terrycloth lining works like a towel, and the prints are all orginal and hand-painted. Falcon and Finch creates beautiful ways to combine crystals and air plants, and are inspired by the fascinating qualities of its materials, as well as a spiritual sense of the natural world. Included in this collection of four are celestite, rose quartz, quartz and amethyst. Mokuyobi is a fun, colorful company that designs backpacks, accessories and clothing, led by the desire to create something different and new using bold colors, magic and awesome sauce. The classic Bedford bag is an all-in-one backpack, over-the-shoulder bag and tote that transforms to suit your needs; it's made of water resistant nylon and has a laptop sleeve. 2x4 Los Angeles is a handmade, detail-rich leather goods and accessories line based in Los Angeles. The company donates half of its proceeds to Union Rescue Mission in Downtown L.A. to aid in the rehabilitation of the homeless population of our city. Alana Douvros Jewelry products are handmade with recycled precious metals and minimally processed gemstones as well as other natural materials. The Shipwreck series of jewelry is inspired by ancient shipwrecks, rough and mysterious in nature but also sparkly and alluring like treasure recovered from deep within the sea. These earrings are made from raw pyrite stone with black patina bronze and 14k gold-filled French ear wires. Why Girls Go Astray is a purveyor of eccentric, extraordinary decoupage wares for the home, specializing in utilizing 18th- and 19th-century techniques and imagery, as seen on the 6x10" Cherry Blossoms tray and the 5x8" Grammar of Ornament tray from their 2017 collection. Inspired by a warm mid-century homestead with a modern twist, Jane & Sienna designs and collects a luxurious selection of dinnerware and inimitable linen collections. The coffee pour-over kit includes a ceramic coffee dripper and pitcher and comes in various colors. The Belle apron-style wrap dress has a feminine touch with ruffles and a long strap that goes around the waist to adjust the size. Alyson Iwamoto's Japanese heritage and L.A. roots deeply influence her work. The crackle glaze on this handmade necklace was inspired by Japanese tea cups and the California desert. It is hand-painted with 18k gold luster and rests on an adjustable leather cord. Calila Designs was born out of the principles and philosophies found in minimalism. The Wanderer Kit is the perfect fold flat travel kit companion, used as a dopp kit or makeup bag, containing all items right on the bathroom sink in the unique tray design. The Commuter Tote has clean lines and a classic style while being versatilve and sturdy, with a water bottle sleeve and quick access pocket to interior laptop storage. Lark Skin Co. is an all-natural line of minimalist and multifunctional skincare products, all handmade with love in small batches. This collection includes the Night + Day Crystal Infused Essential Oil Blends, New Moon Ritual Salts, Lavender + Mint Lotion Bar and Mint + Honey Lip Balm. One Bright Morning is focused on creating unique functional and wearable ceramic objects, like this geometric ceramic vase with hand painted patterns and a pair of gold-dipped ceramic studs. Paper8 is dedicated to bringing you one-of-a-kind artwork and apparel from artist Matt Warren. By re-imagining and altering elements from a film’s marketing campaign, like composition, bits of dialog, typeface, color and still photos, Warren plays with his audiences’ sense of familiarity, while framing the film in a fresh way. These shirts are from three Quentin Tarantino classics: Pulp Fiction, True Romance and Kill Bill. Small Batch Supply Co. makes useful goods in small batches like this all-leather camera strap made with solid copper rivets and a sturdy key clip. Every component is produced and finished in the United States, including the leather, clip and rivet. The copper rivet is the ultimate in beauty and strength. Ren Vois is the ceramic design studio of fashion designer-turned-potter Tina Huang. Working exclusively with porcelain, she hand-colors and throws each piece on the wheel to create a unique marble effect. Every piece is one of a kind, including these two vases in tangerine and lavender-marbled porcelain measuring 6" and 4" tall. CONTEST RULES: One entry per person. These competitions are open to any U.S. resident (unless otherwise stated) except employees of Time Out and sponsoring organizations, their agents or anyone directly connected to these promotions. No purchase required for this promotion. Contest valid 6/27/17 through 7/9/17 at 11:45PM PT. Prizes are as described above; no cash alternatives will be given. Prizes may not be sold, traded, transferred or refunded. Any and all federal, state and local taxes are the responsibility of the winner. If for any reason winners are unable to use prizes within the time specified, the participating organizations are not responsible for providing replacement prizes. No make goods will be given in the event of a canceled or rescheduled event. Total prize valued at $2,137.